As the somewhat ambitious title suggests my wife and I am looking for a nice home stay or similar somewhere around Kochi in January. We traveled to Kannur and Costa Malabari back in 2009 and had a brilliant two or three week stay there. The place was situated among palm trees and pretty much nothing else, just 100 meters from an untouched beach we only shared with some fishermen. Three meals included every day in a communal space. The place was pretty basic on the surface, but perfectly clean and had all you could wish for. Something similar would be great, but we could also go for something more resort like, like a private hut or cabin with a toilet/bathroom. The key for us is somewhere quiet, calm and relaxed within walking distance of a beach. A 1-2 hour taxi ride either direction from Kochi would be no problem. Maybe even 2,5 hours if the place is the mother of all home stays. - Budget up to 4000 RS, but I wouldn't mind cheaper as long as it's a good place. - Some place where there's a small town not too far away, with the option of checking out the local food would be cool. - Few tourists would be preferable (if that's possible in January), by that I mean not some massive tourist HQ with a lot of hotels and resorts heaped onto each other. I recall I read, back in the days, that Varkala and Kollam are places like this. Something a bit more untouched and with a local feel to it would be great. - Not an all inclusive Ayurveda or yoga place. Apart from reading about Vypin back in 2009 I have no knowledge of the area around Kochi. If there's something similar to my preferences around there someone would recommend that would be nice. If anyone know a hidden gem anywhere else that would also be awesome. The obvious answer is Cherai beach, since it is very close to Cochin (a short ferry boat ride then a bus/rickshaw ride). But it is neither deserted nor devoid of tourism. If you were happy to go further south, you could check out Poovar. * It is far down near the border with Tamil Nadu (south of Kovalam). It meets quite a few of your requirements. * Back in 2006 we spent a week at Friday's Place in Poovar. It is a homestay on the backwaters. Idyllic. But pricey. There are surely other hideaways near there. I've no idea of Kerala, but there are a few places up in Maharashtra that could meet your criteria. Kuzhupilly Beach could be an option. Thanks for the tips Theyyam, I'll check out that place you mention. In Maharashtra the options are Guhagar / Velneshwar / Dive Agar / Harnai / Sasawane / Malgund / Devbagh / Mith Mumbri / Tara Mumbri / Bhogwe etc. Some years ago we spend some lovely days at the beach of Vodarevu. Unfortunately it is on the Anndra Pradesh coast, near Chirala and Vijayawada. We stayed in a very basic resort, nearby Rampuram beach seems to have better options. That actually looks perfect! Is Pune the closest airport? We'll be flying from Delhi. Maybe a train from Mumbai? If you plan for Ganeshgule you will have to get down at Ratnagiri if traveling by train. If you plan for Bhogwe you will have to get down at Kudal / Kankavli if travelling by train. For Bhogwe, the airport at Goa is quite close, but finding a taxi to ferry you across the state border may be an issue. You can alternately hire a car from the Maharashtra side. For Ganeshgule, a train from Mumbai to Ratnagiri as aarosh said is a more comfortable and faster option. Depending on your itinerary, if you find yourself in Kerala/Goa before coming to Maharashtra coast, you can catch a direct train towards Mumbai. All trains on the western coastal (Konkan) route halt at Ratnagiri from where you can head to Ganeshgule. A few halt at Kudal/Sawantwadi/Sindhudurg/Kankawali which can be used to head to Bhogwe. There is a MTDC resort at Velneshwar near Guhagar. Nearest railway station is Chiplun around 50 kms away. What is your expectation from the hotel / home stay? If you are okay with basic comforts any one of the beaches that I mentioned earlier can provide that. There are quite a few options around Alibaug. Nagaon beach / Akshi beach / Sasawane beach / Revdanda beach. Alibaug is around 100 kms from Mumbai. There are also ferries from Gateway of India to Mandwa. Bus fare to Alibaug is included in the ferry cost. A secluded beach that I have been to a couple of times is Tambaldeg in Devgad district. I have my in-laws family staying at a nearby village so don't know about stay options there. Google maps show a Maulis Farm House in the village. 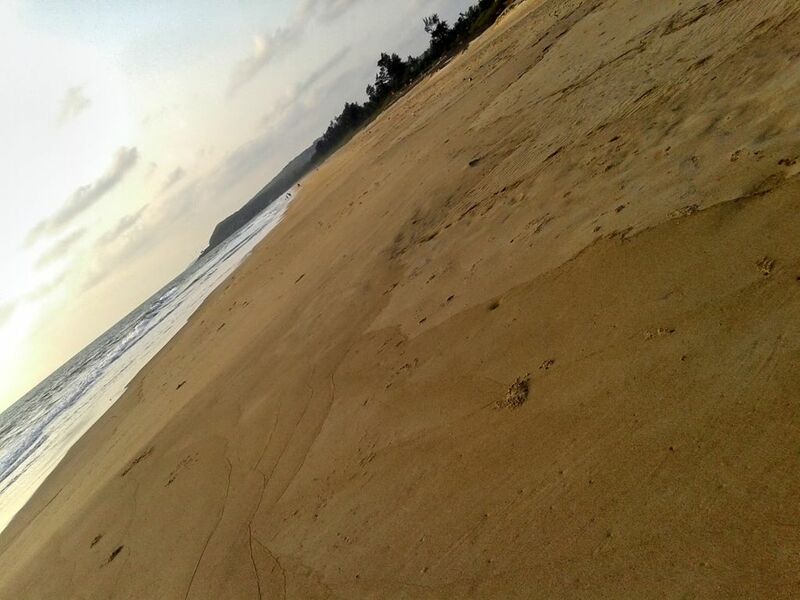 At one end of the beach you will see Naringre river meeting the sea. Another beach near Tambaldeg is Gajbadevi Beach, which also has a temple of Gajbadevi. A MTDC resort will open in the near future there. Woah, thanks for all the input! I will have a look at the options, I guess somewhere close to an airport would be best so you can get there rather fast with a taxi, but I enjoy a train ride as well. The only issue with trains is the pain of booking the tickets, unless that's changed since 2011-ish. As for a home stay I expect a clean place, clean bathroom (with a western toilet preferably) and nice owners. It doesn't have to be luxurious. The place we stayed at outside Kannur (Costa Malabari) was perfect in that sense. If you are looking for Maharashtra then Alibaug will fit the bill. Kumarwadi in Revdanda could be an option. Palms Cottage in Nagaon could be another. Jaswand Holidays in Akshi could be another. If you are looking for a place near Ernakulam I had given an option earlier.